^ Peter Aspden. 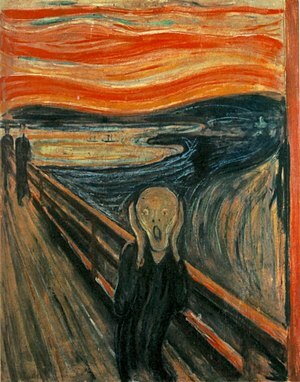 So, what does ‘The Scream’ mean?. Financial Times. 2012-04-21. ^ 2.0 2.1 2.2 2.3 2.4 2.5 2.6 2.7 2.8 Diagnostic and Statistical Manual of Mental DisordersAmerican Psychiatric Associati. 5th. Arlington: American Psychiatric Publishing. 2013: 189–195. ISBN 978-0890425558. ^ 3.0 3.1 3.2 Anxiety Disorders. NIMH. March 2016 [14 August 2016]. （原始内容存档于27 July 2016）. ^ 4.00 4.01 4.02 4.03 4.04 4.05 4.06 4.07 4.08 4.09 4.10 Craske, MG; Stein, MB. Anxiety.. Lancet. 24 June 2016. PMID 27349358. doi:10.1016/S0140-6736(16)30381-6. ^ Testa A, Giannuzzi R, Daini S, Bernardini L, Petrongolo L, Gentiloni Silveri N. Psychiatric emergencies (part III): psychiatric symptoms resulting from organic diseases (PDF). Eur Rev Med Pharmacol Sci (Review). 2013,. 17 Suppl 1: 86–99. PMID 23436670. （原始内容存档 (PDF)于10 March 2016）. ^ Kessler; 等. Lifetime prevalence and age-of-onset distributions of mental disorders in the World Health Organization’s World Mental Health Survey Initiative. World Psychiatry. 2007, 6 (3): 168–76. PMC 2174588. PMID 18188442. ^ Jeronimus B.F.; Kotov, R.; Riese, H.; Ormel, J. Neuroticism's prospective association with mental disorders halves after adjustment for baseline symptoms and psychiatric history, but the adjusted association hardly decays with time: a meta-analysis on 59 longitudinal/prospective studies with 443 313 participants. Psychological Medicine. 2016. PMID 27523506. doi:10.1017/S0033291716001653.